Tom will talk about various ways to use a natural edge in your turnings. 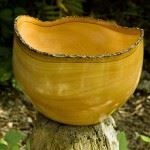 He will discuss different projects that can use the natural edge and then will turn a natural edge bowl. Tom is the owner and woodturner-in-chief at Hasting Coastal Woodworks, a gallery and studio in Newport, Oregon. He has been working with wood all his life. His Dad had a cabinet shop, and he became addicted to turning in about 2004. He enjoys making one of a kind pieces, especially vases, but also does a lot of old chair spindle repair work. See details at http://www.hastingcoastalwoodworks.com/ .